[FREE IRAN Project] In The Spirit Of Cyrus The Great :: View topic - Is this how you stand with the Iranians? Is this how you stand with the Iranians? Posted: Fri Jun 03, 2005 8:04 am Post subject: Is this how you stand with the Iranians? On February 2, 2005, you issued clear warnings to Syria and Iran that they were next in your sights declaring a mission to spread democracy around the world. In your state of the Union you said� There are still governments that sponsor and harbor terrorists, but their numbers have declined. There are still regimes seeking weapons of mass destruction, but they are no longer without attention and without consequence." the clerical regime in Tehran. You declared "to the Iranian people, I say tonight: As you stand for your own liberty, America stands with you." Mr. President; your promises to a nation must be kept to prove the American decency and sincerity. your former Secretary of the State Mr. Powel declared the uprising a �family feud� and washed his hands off. contracts or rules of international diplomacy. The IRI has a renegade tract record for the past 26 years that is undeniable. One of the required principals in Shia Islam is Taghieh, which means that they lie even under oath, when they think their action is helping Islam. Therefore when the regime leaders are under pressure to sign an agreement, they submit only to perform Taghieh and do the exact opposite at a later time. How can one negotiate and reach an agreement with these people? How could your administration be concerned that passage of H.R. 282/S. 333 legislation might disrupt sensitive negotiations about Iran's nuclear program? EU�s current policy for the sustenance of the IRI regime will only buy you hatred and amplify the Iranians� fury. I urge you to take the Iranian people�s side before it is too late! 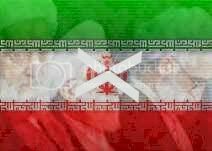 Posted: Fri Jun 03, 2005 3:31 pm Post subject: Where Is The Real Support for a Free Iran ? 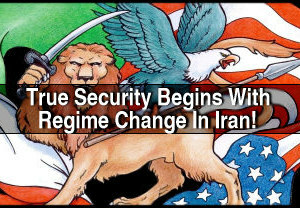 Time is Running Out: Where Is The Real Support for a Free Iran from the Bush Administration? 1) "And secondly, I appreciate those courageous souls who speak out for freedom in Iran. They need to know America stands squarely by their side. And I would urge the Iranian administration to treat them with the utmost of respect. " 2) President Bush Praises Iranian Pro-Democracy Protestors KENNEBUNKPORT, Maine (Reuters) - President Bush on Sunday praised pro-democracy demonstrators in Iran, calling their protests a positive step toward freedom. "This is the beginning of people expressing themselves toward a free Iran which I think is positive," President Bush said. "I think that freedom is a powerful incentive," Bush told reporters after he attended church services during a weekend visit to Kennebunkport. "I believe that some day freedom will prevail everywhere because freedom is a powerful drive." "And so for the United States we have to stand with the aspirations of the Iranian people, which have been clearly expressed." "The regime in Tehran must heed the democratic demands of the Iranian people or lose its last claim to legitimacy,"
WASHINGTON - U.S. President George W. Bush on Thursday challenged Iran and Syria and even key U.S. ally Egypt to adopt democracy and broke with past U.S. policy by vowing Washington will not support Arab states that reject liberty. "The regime in Tehran must heed the democratic demands of the Iranian people or lose its last claim to legitimacy," Bush said in a sweeping foreign policy speech. He said Syrian leaders as well as those ousted in Iraq had promised a restoration of ancient glories but instead left "a legacy of torture, oppression, misery and ruin." Of Egypt, whose president, Hosni Mubarak, has been a vital Middle East interlocutor for successive U.S. presidents, Bush said: "The great and proud nation of Egypt has shown the way toward peace in the Middle East and now should show the way toward democracy in the Middle East." The speech was Bush's latest attempt to justify the war in Iraq as necessary to foster democracy in the region at a time when he is under fire for mounting U.S. troop casualties and as anti-Americanism spreads among many Muslims who feel Islam is under attack. Bush declared a failure of past U.S. policy spanning 60 years in support of governments not devoted to political freedom. He called for democracy throughout the Middle East, praising the tentative steps that are taking places in such nations as Morocco, Bahrain, Kuwait and even Saudi Arabia, whose royal family is firmly in command. "Are the peoples of the Middle East somehow beyond the reach of liberty? Are millions of men and women and children condemned by history or culture to live in despotism? Are they alone never to know freedom and never even have a choice in the matter? I, for one, do not believe it," Bush said. I am very disappointed in the recently disputed parliamentary elections in Iran. The disqualification of some 2,400 candidates by the unelected Guardian Council deprived many Iranians of the opportunity to freely choose their representatives. I join many in Iran and around the world in condemning the Iranian regime's efforts to stifle freedom of speech -- including the closing of two leading reformist newspapers -- in the run-up to the election. Such measures undermine the rule of law and are clear attempts to deny the Iranian people's desire to freely choose their leaders. The United States supports the Iranian people's aspirations to live in freedom, enjoy their God-given rights, and determine their own destiny. "Our future also depends on America's leadership in this world. The momentum of freedom in our time is strong, but we still face serious dangers. Al Qaeda is wounded, but not broken. Terrorists are testing our will in Afghanistan and Iraq. Regimes of North Korea and Iran are challenging the peace. If America shows weakness and uncertainty in this decade, the world will drift toward tragedy. This will not happen on my watch." To be sure, in our world there remain outposts of tyranny and America stands with oppressed people on every continent ... in Cuba, and Burma, and North Korea, and Iran, and Belarus, and Zimbabwe. The world should apply what Natan Sharansky calls the ``town square test'': if a person cannot walk into the middle of the town square and express his or her views without fear of arrest, imprisonment, or physical harm, then that person is living in a fear society, not a free society. We cannot rest until every person living in a ``fear society'' has finally won their freedom. Are we going to help hostages or hostage takers (Mullahs, Tony Blair and Jack Straw) ? This is a question for Dr. Rice and Bush Admin. The EU Big 3 ignored the legitimate rights of Iranian people and their demands, they negotiated with the Regime and signed contracts with illegitimate Islamist Regime. WASHINGTON - The United States didn't invite Iran to an international conference on Iraq reconstruction, which became awkwardly clear Thursday when a European diplomat said Iran is welcome in spite of long-standing enmity between Washington and the Islamic regime in Tehran. The European Union and Iraq are joining the United States in hosting the conference on June 22 in Brussels. Secretary of State Condoleezza Rice announced plans for the conference last month while in Iraq, and the State Department released details this week. Iran's participation had not been mentioned until a reporter asked about it during a press conference with European diplomats at the State Department. Rice gave no direct response. Instead, she ticked off U.S. and international complaints about Iran, including allegations that Iran supports terrorists, thwarts Mideast peace and may be developing a nuclear weapon. Iran and the United States have had no diplomatic relations since the seizure of the American Embassy in Tehran by Iranian students in 1979. "We don't have relations with Iran. Everybody understands that. And we have our differences with Iran," she said. Then Luxembourg Foreign Minister Jean Asselborn, noting that his country has the presidency of the European Union, told reporters: "Luxembourg has relations with Iran. Iran are invited." Rice quickly followed Asselborn's statement by saying the United States has no objection to including Iran. "We want Iran and Iraq to have good, neighborly, transparent relations. And to the degree that this serves that cause, we're all for it," she said. It is not clear whether Iran will attend the one-day conference. Separately, Rice said the United States has a heavy joint agenda with Europe that should not be affected by the European Union's stumble over ratification of a common constitution. Voters in France and the Netherlands rejected the constitution, which would have streamlined operations of the 25-member alliance. "We understand that this has been a difficult period and that there will be some period of reflection going forward, but we continue to hope for an outward-looking Europe, not an inward-looking one," Rice said. EU External Relations Commissioner Benita Ferrero-Waldner tried to be reassuring. A united Europe will continue to work alongside the United States to promote peace between Israel and the Palestinians and on Iraq, she said. "We are able to work with you as well today as we did yesterday. And some people have suggested we will now be too absorbed in our own crisis to pursue our external policies. I promise you, this will not be the case." Rice also offered a skeptical view about Iranian presidential elections scheduled for later this month. Iran's hard-line watchdog Guardian Council has severely limited the number of candidates who can participate, although it recently bowed to pressure and allowed two reformist candidates to run. "I mean, it's ... not a very pretty picture of this election, quote-unquote, that is going to take place in a couple of weeks when candidates have been summarily dismissed by an unelected Guardian Council," Rice said. Iran shares a long border with Iraq, and the two nations fought a lengthy war in the 1980s. They share many historical, religious and cultural bonds, however, and some members of Iraq's new government have old ties to Iran. The United States has said little in public about Iranian influence over Iraq since the successful Iraqi elections in January, but Rice brought it up Thursday. "I have never believed that the Iraqi people, having thrown off the yoke of Saddam Hussein, now wish to subject themselves to the rule of the Guardian Council of Iran," she said. "And so I really do believe that the Iraqis, left to their own devices, will find their own path." Rice said she discussed Iran with the Iraqi foreign minister during a meeting in Washington on Wednesday. "We would like nothing better than for Iran to be devoted to a stable Iraq in which Iran is not trying to interfere in Iraq's internal affairs," Rice said. From outside as we read public news, see big contradiction between what Dr. Rice said 6 months ago and her actions in past few months to satisfy EU3 Neo Colonialist and Terror Masters in Tehran. Is Bush Admin submitting to the Terror Masters and EU3? Hope Bush Admin clarify their Iran policy soon. WASHINGTON - U.S. intelligence and foreign allies have growing evidence that wanted terrorists have been residing in Iran despite repeated American warnings to Tehran not to harbor them. The evidence, which stretches over several years, includes communications by a fugitive mastermind of the 1996 Khobar Towers bombing and the capture of a Saudi militant who appeared in a video in which Osama bin Laden confirmed he ordered the Sept. 11 attacks, according to U.S. and foreign officials. They spoke on condition of anonymity because much of the evidence remains classified. Saudi intelligence officers tracked and apprehended Khaled bin Ouda bin Mohammed al-Harbi last year in eastern Iran, officials said. The arrest came nearly three years after the cleric appeared with bin Laden and discussed details of the Sept. 11 planning during a dinner that was videotaped and aired across the world. The capture was a coup for Saudi Arabia, which spent months tracking him and setting up the intelligence operation that led to his being taken into custody in exchange for eventual amnesty. The officials said interrogations of al-Harbi, who is now in Saudi Arabia, have yielded confirmation of many al-Qaida tactics, including how members crossed into Iran after the U.S. began military operations to rout al-Qaida and the Taliban from Afghanistan. Al-Harbi is believed to have been paralyzed from the waist down while fighting in the 1990s alongside Muslim extremists in Bosnia and Afghanistan, and he surprised intelligence officials when he appeared in the December 2001 video with bin Laden. "Everybody praises what you did," al-Harbi said on the tape. U.S. and foreign intelligence agencies also have evidence stretching back to the late 1990s that indicates Ahmad Ibrahim al-Mughassil remains hiding in Iran. He is wanted as one of the masterminds of the Khobar Towers bombing in Saudi Arabia that killed 19 Americans. Al-Mughassil, who also goes by the alias Abu Omran, has been charged as a fugitive by the United States with conspiracy to commit murder in the attacks and has a $5 million bounty on his head. U.S. authorities have long alleged the 1996 bombing was carried out by a Saudi wing of the militant group Hezbollah, which receives support from Iran and Syria. Intelligence agencies gathered evidence, including a specific phone number, as early as 1997 indicating al-Mughassil was living in Iran, and have other information indicating his whereabouts. U.S. officials have not publicly discussed the Saudi capture of al-Harbi or their evidence on al-Mughassil's whereabouts, but have increasingly raised questions about Iran's efforts to turn over other suspected terrorists believed to be under some form of loose house arrest. Nicholas Burns, State Department undersecretary for political affairs, told Congress last month that Iran has refused to identify al-Qaida members it has in custody. "Iran continues to hold senior al-Qaida leaders who are wanted for murdering Americans and others in the 1998 East Africa Embassy bombings and for plotting to kill countless others," Burns said. Top administration officials have repeatedly warned Iran against harboring or assisting suspected terrorists. U.S. intelligence this week has been checking some reports, still uncorroborated as of Friday, that Abu Musab al-Zarqawi, al-Qaida's leader of the Iraqi insurgency, may have dipped into Iran, officials said. On Wednesday, Defense Secretary Donald H. Rumsfeld warned countries in the Middle East not to help al-Zarqawi. "Were a neighboring country to take him in and provide medical assistance or haven for him, they, obviously, would be associating themselves with a major linkage in the al-Qaida network and a person who has a great deal of blood on his hands," Rumsfeld said. � Saad bin Laden, the son of the al-Qaida leader whom U.S. authorities have aggressively hunted since the Sept. 11 attacks. � Saif al-Adel, an al-Qaida security chief wanted in connection with the deadly 1998 bombings of U.S. embassies in Africa. � Suleiman Abu Ghaith, the chief of information for al-Qaida and a frequently quoted spokesman for bin Laden. U.S. and foreign intelligence officials say they believe those three are under some form of house arrest or surveillance by Iranian authorities. Kenneth Katzman, a Middle East analyst at the Congressional Research Service, said the conditions that some of suspected terrorists are living under are unclear. Katzman said it's possible they are being held in guarded villas and he doubts any detention is uncomfortable. "I think that Iran sees these guys as something of an insurance policy," he said. "It's leverage." Rasool Nafisi, a Middle East analyst who studies conservative groups in Iran and travels there frequently for research, said Iran has returned some lower-rank operatives to their home countries but probably is keeping higher-ranking operatives as a bartering chip. "Remember, Islamic tradition is very much based on haggling," Nafisi said. "Everything is negotiable, and you haggle for everything. If I were the Iranian government, I'd be very happy to have them and to use them in future negotiations with the United States." 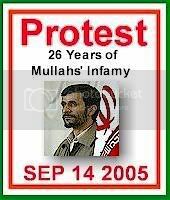 Please sign this petition ( http://mehr.org/petition_WTO.htm) to tell President Bush that the US words with respect to the Iranian people and their enemy, the Islamic Regime, do not match its deeds. Different threats require different strategies. In Iran, we continue to see a government that represses its people, pursues weapons of mass destruction and supports terror. We also see Iranian citizens risking intimidation and death as they speak out for liberty and human rights and democracy. Iranians, like all people, have a right to choose their own government and determine their own destiny and the United States supports their aspirations to live in freedom. Economic Sanction against the Islamic Regime of Iran for sponsoring terrorism. More than 200 companies including Halliburton and GE have been making deals with the Islamic Regime during the entire period that sanction was supposed to be imposed. The conditions for re-establishment of relation with the �axis of evil� have been reduced to only one: A promise to stop the enrichment of uranium. Human rights violation in Iran is completely out of picture. Acceptance of the Islamic Regime in the World Trade Organization as an incentive. The Islamic Regime has to be taken off the terrorists list before this can happen. MEHR is registered as a non-profit organization. as i said, pres. Bush tends to stand with weird groups like MEK rather standing with true Iranian people who want a secular democracy back in Iran. Secretary Rice stated a few days ago that truly democratic elections would be one of the conditions for Iran to actually achieve membership in the WTO. Anyway, it will take ten years minimum to achieve membership (by which time the regime will be long gone), the structural transformations required would destroy the regime in and of themselves, and the US's declining to block the process is being done to keep the Euro Big 3 on board for sanctions if needed. So the WTO non-block might look like one step back, but I believe the President is taking it on a non-decisive matter in order to take two or three steps forward on important stuff like general Western sanctions in the very near future. I believe those sanctions will be key to getting anything like a velvet revolution if the mullahs don't fall this month. Posted: Mon Jun 06, 2005 3:55 am Post subject: oh, dear Dr. Etebar ! IS THIS HOW YOU STAND WITH IRANIANS? Asking them to stay at home, when they're ready and wiling for a National Uprising? How can they expect a foreign president to come to their resque when their own "freedom Movements" discourage them from the uprising already planned and on the way? I remind you: the same uprising that (we)'ve all been waiting for! the same uprising that president Bush expects from a nation that longs for freedom! I don't remember Pr. Bush ever saying: STAY HOME ! and we'll come to your resque! as you STAND UP for your own freedom, America will stand with you. and what you have to say to the - people of Iran - dear Ramin? bring a bunch of their thugs from diff. cities to vote several times, as usual, and pretend all is good in front of the world media? and please, don't repeat the same old lines that - if the streets are deserted, the world will know people are not backing up the regime - the world must be either blinded by $$$ or completely ignorant not to know the truth by now. in either case, QUIET STREETS will be to their advantage! since they wont have to postpone or break the Lucrative deals, OR heaven forbid aknowledge the illegitimacy of mullahs. Same thing happened in the last election. You've managed to keep the people behind locked doors. I haven't heard of any world leader declaring the illetimacy of IRI since then. now why would that be? I tell you why. It's because they prefer to close their eyes and ears when it comes to Iran and my nation's freedom! WE'LL OPEN THEIR EYES AND EARS ! mr president is now busy giving lots of incentives to the mullahs and call them REASONABLE. How trading with Mullahs became reasonable in mind of Mr president? As I have explained in another thread, letting the WTO membership process start would not bear any fruit cashwise for Iran for many years, and would require such wrenching readjustments for Iranian commercial and governmental structure that they would probably wreck whatever remains of the regime at that time. Bush is letting this process start in order to obtain the cooperation of the Euro Big 3 on the imposition of sanctions against the regime which he likely could not obtain from them by any other reasonable means. Immediate sanctions by the EU or its biggest states would be a billion times more important to a velvet uprising than any eventual WTO admission years from now. The Bush team views the potential reward as well worth the slight risk and I'd have to agree based on the various signs I've seen. One could say than in love, war, diplomacy, and "stopping the car in time", is all a mater of timing. A lot's been going on in quiet ways, and how the second point in this excerpt from the following joint statement effects the IRI, remains to be seen....but I offer it as a clue to what's in the wind.